My Birchbox shipped and showed up pretty early this month! I'll say that, while I was excited to get it so early, I canceled my Birchbox subscription this month. It's not that it has been terrible, or even all bad, over the last few months...but when you're consistently finding yourself not excited or even disappointed in a service each month, it's time to cancel! After all, there are a ton of subs out there and general discontent means I can find another one to suit my current needs better! Juice Beauty Oil Free Moisturizer - I have used this moisturizer (and several other products) from Juice Beauty before. I really like it! It is light enough for the summer and doesn't cause me to break out. I'm currently working on completely overhauling my skincare routine (man, my skin is unhappy this summer) so I know this will get use, eventually. stila stay all day liquid lipstick - I love stila, and I am always happy to receive items from the brand. However, this particular item, I will be trading. Not because there is anything wrong with it (actually, I have heard it is awesome with great staying power), but simply because I am currently swimming in red lip products...I have them coming out of my ears! So, as much as I'd like to open this and try it, I figure it's better to pass it off to a home where it will be properly loved. I know I wouldn't reach for it as often as I should! Jasmine Seven Fresh Feet Wipes - This is one of those products I'm undecided on. On one hand, I am barefoot as much as possible and my feet do get dirty. On the other hand, I don't really sub to a beauty service to receive two minty wet wipes. So, I'll use the samples (actually, I already used one. ) It feels nice on the feet, but a similar effect can be had with a baby wipe and a swipe of minty foot lotion, which I already have. TanTowel Self Tanning Towelette for the Body - Okay. This might be a great product. I wouldn't know, because there is nothing in the beauty product world I despise more than I despise self tanners. There is nothing I am less likely to use. Birchbox seems determined to send me these things, and I really wish there was a way to opt out of receiving them. I like my pale skin, and I have no desire to change it. This isn't something like makeup that you can try and wipe off if it doesn't suit you. They wouldn't send out hair dye or skin bleach...so why are they so determined with the tanner? Even if I wanted to use it, one wipe is for one half of the body...so what are you supposed to do for the other half? This has already been given away. Coastal Scents mini quad from the Mirage Palette - I was surprised to see Coastal Scents in my Birchbox this month. I love Coastal Scents, as is evidenced by the more than 400 shadows I own by them. But, I already have the Mirage palette, so I'm giving this sample away. The colors are beautiful, though, and like all over Coastal Scents shadows, they are super pigmented for the low price. If you do want to buy this (or any other CS palette) make sure to buy from Coastal Scents directly, as Birchbox has majorly marked up the price! Overall, I am not regretting cancelling. The moisturizer and the stila are great products, but this just wasn't the best box for me. 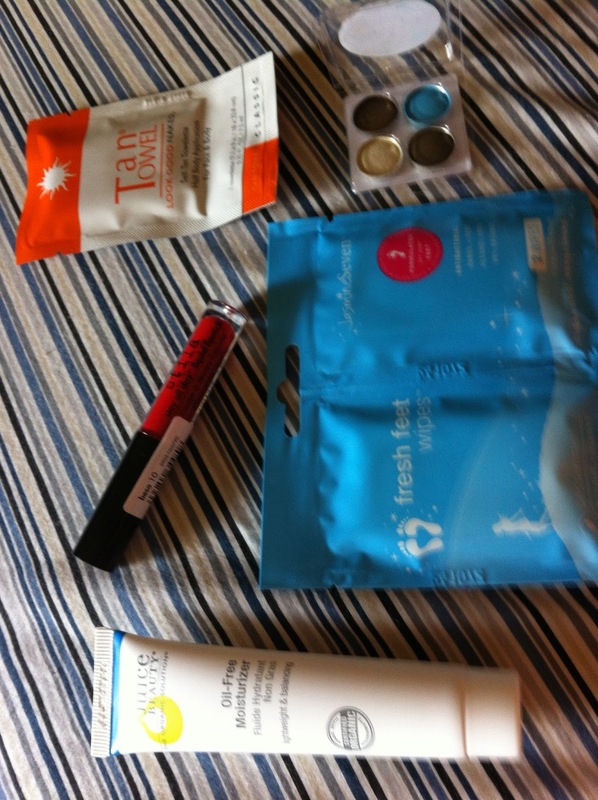 I am sure over time I will find myself missing the Birchbox points system, though, and come crawling back!